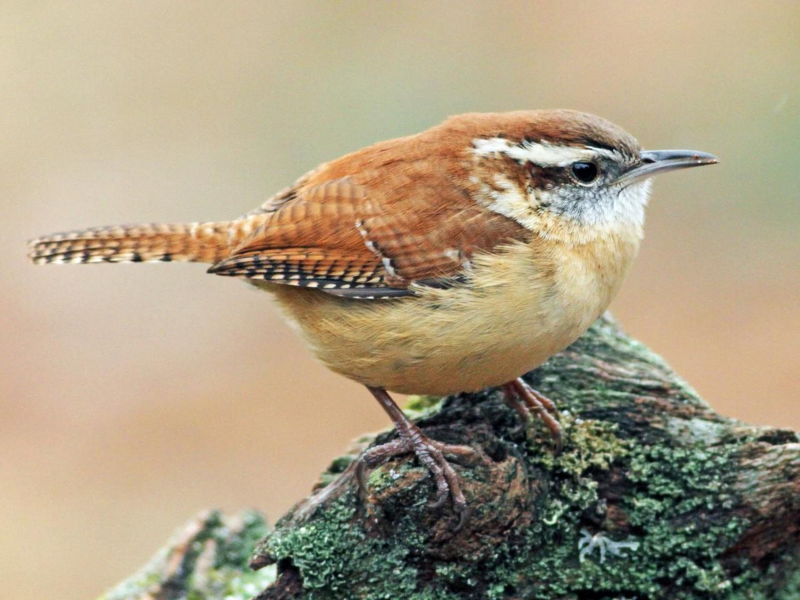 Wrens are cute, tiny birds, 4 1/2 to 5 1/2 inches long, tip of the beak to the tip of the tail. If you hear one singing but can't see it, you may think this is one very large bird because its voice is so powerful and loud and very beautiful. Being a shy bird, you don't often see them. I'm lucky that I've been living near woods where they stay, but they venture into my yard to forage and eat suet. Nesting season is now upon us. 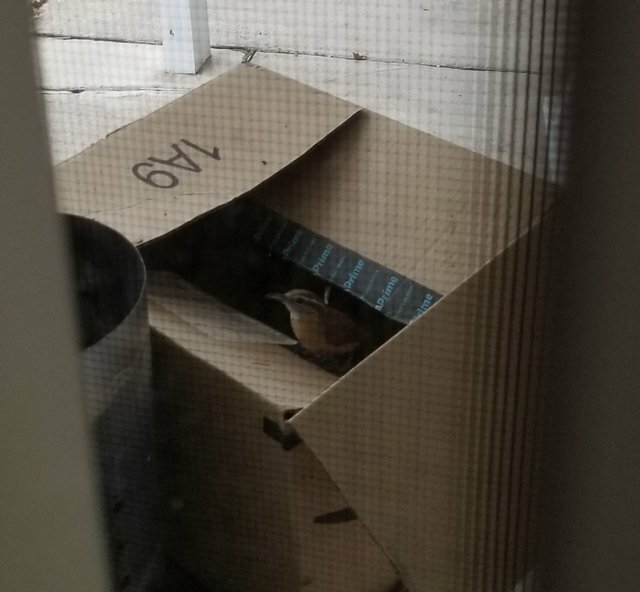 For 3 years in a row, a House wren, which is very similar to the Carolina wren except for a duller brown color, built a nest in a hollowed out, painted gourd hanging by my back door near the electric box. This year, I have't seen the House wren yet, but I am super happy that 2 Carolina wrens are building a nest here. Wrens choose some odd places for their nests. Nests have been found in pockets of clothes hanging on a clothesline, in hanging plants, tin cans, empty flower pots... I even heard of a woman who had left her bathroom window open and came back a few days later to find wrens nesting in an open drawer! 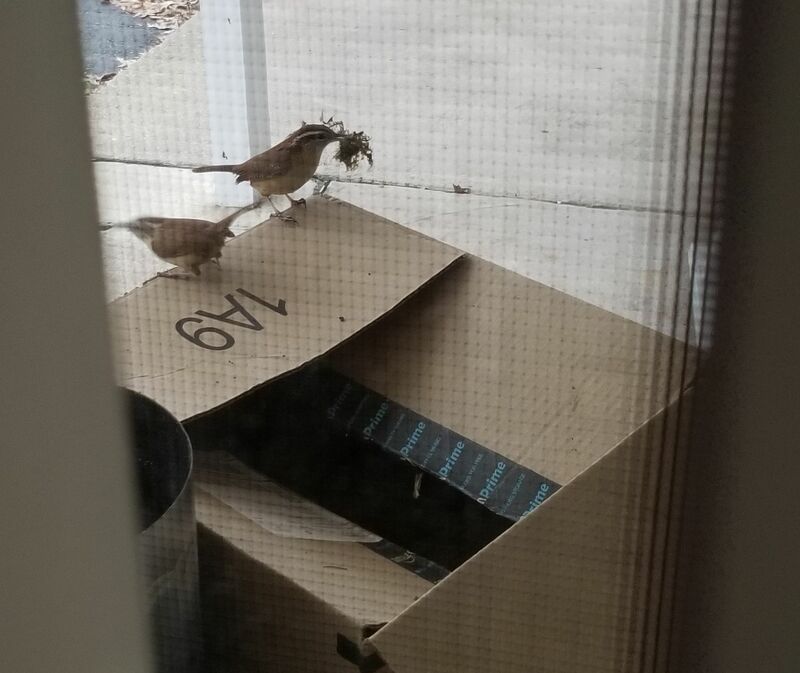 My 2 Carolina wrens are currently building a nest in a cardboard box with an open flap. I left it outside my kitchen window in the covered walkway. There are tools in it that I was using while painting a patio table. They are super industrious when building a nest, working at it together. They go back and forth, back and forth with their little beaks holding leaves, pine needles, tiny sticks, grasses and other yard debris. I would love to see the inside of the box! They've been at it for 3 days. It surprises me that they chose something that large. I can't see into it so I don't know if they are filling it up or found a smaller container to use. I can't wait to see the baby birds but I don't know how they will peek out. The hanging gourd by my back door has a little hole that they'd poke their tiny heads out of. Wait and see! I took these pictures from my kitchen window, through the screen. I don't know as I've ever seen one up here. We have the house wrens, sometimes on both sides of the house. If you have lots of woods near you, they are likely hidden in there. I think house wrens are a bit bolder.
" I think house wrens are a bit bolder." Now that's a masterful understatement.... LOL They have a SERIOUS Napoleon complex!! Almost have a pheasant look don't they? Yes but much tinier. They are so adorable. Pheasants a are quite large by comparison.